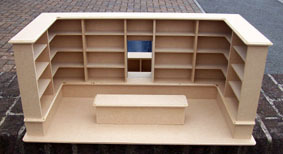 For enthusiasts who do not have the room for a full sized shop we have designed a Victorian style shop display. Using the latest CAD/CAM software all joints have either been grooved or rebated to enable the shop display to be assembled without the use of glue or pins. Can be assembled first without glue or pins. Easy to follow assembly instructions with photo images.